Prepare a marinade of brown sugar, sweet chilli sauce, teriyaki, water and crushed garlic. Add the steaks to the marinade and leave to marinate for 3-4 hours or overnight. 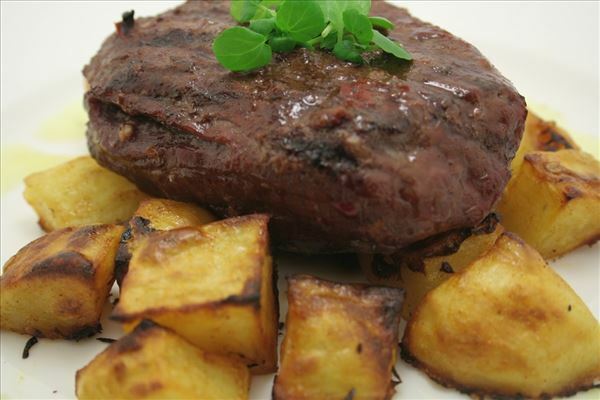 Prick the steaks with a fork so that the marinade penetrates the meat. Preheat the oven to 200ºC/fan oven 180ºC. If you are planning to barbecue the steaks, remember to light the grill now. Peel the potatoes and cut into large cubes. Put the potatoes in a bowl. 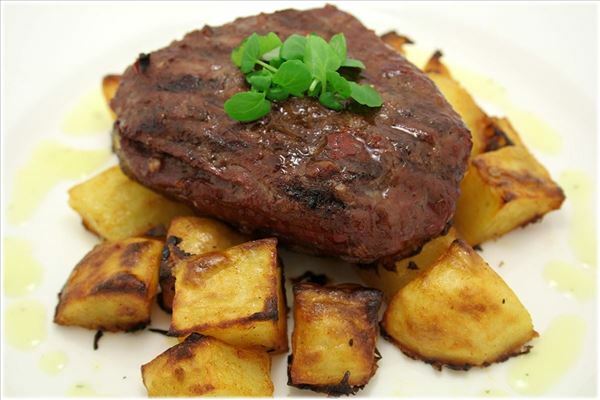 Pour rapeseed oil, barbecue sauce and salt over the potatoes and stir until coated with a spoon. Place the barbecue potatoes on a baking tray lined with baking paper and bake for approx. 40 mins. Fry the steaks in a pan or grill on the barbecue. Melt the butter in a pan, adding the cream, egg yolks, tarragon and béarnaise essence. Gently heat the sauce, whisking all the time. Do not let the béarnaise sauce begin to boil or it will separate. Season with salt and lemon pepper. 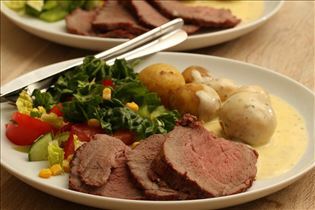 Serve the steaks on a bed of barbecue potatoes with béarnaise sauce and garnish with fresh herbs.